At Ripple’s inaugural conference, it was all about the use case. On day one of its much-anticipated Swell event in Toronto yesterday, panels largely centered on the distributed ledger company’s existing clients and proofs-of-concept. There, representatives from Banco Santander and Siam Commercial Bank talked about how Ripple – and its XRP cryptocurrency – has provided a beneficial rail for cross-border payments. Yet, the event was largely pessimistic about the value proposition of other cryptocurrencies (such as bitcoin and ether). Not only did former Federal Reserve chairman Dr. Ben Bernanke (who led the U.S. central bank during the 2008 financial crisis) question whether bitcoin would be successful, but many of Swell’s panelists made it clear that just by speaking about blockchain technology, they were not promoting bitcoin and other “unregulated” cryptocurrencies. Cryptocurrency’s “promise was to replace credit cards and banks and that’s been an abysmal failure,” said Patrick Griffin, senior vice president of business development at Ripple. Instead, Griffin continued, XRP is the only enterprise-grade option for banks and other mature financial institutions. To be fair, XRP wasn’t pumped quite so hard until the last panel discussion, when Griffin got on stage with Marwan Forzley, CEO and co-founder of cross-border business-to-business payments provider Veem, and Oliver T. Bussmann, founder and managing partner at Bussmann Advisory. Most of the day, though, was spent discussing the advantages of distributed ledgers (also Ripple) over the current labyrinthine financial system. Not only does distributed ledger technology grant faster, cheaper and more reliable payments, but Ripple’s position in the ecosystem will allow it to scale, according to Ed Metzger, head of innovation at Banco Santander. “Payment networks derive value from ubiquity. And the positioning of Ripple in that space is very attractive,” Metzger said. If you don’t have a network, then the technology doesn’t have value in the future, he continued. Since the summer of 2012 when Ripple first launched, the company has partnered with more than 100 financial institutions who are now utilizing its global payments network. As such, many of Ripple’s clients were at the event, some on panels explaining the benefits they observed during proofs-of-concept with the company’s technology. For Banco Santander, its Ripple trial has demonstrated that it can answer customer pain points, like the significant time it takes international remittances to reach their destination and the significant fees that are extracted from those transactions. “There are use cases where speed and certainty of the amount being delivered are important,” Banco Santander’s Bussmann said. He continued, saying that the real question in the UK and throughout Europe is how can institutions replicate the real-time domestic payment system there for international payments. In separate panels, Dr. Arak Sutivong of Siam Commerical Bank and Veem’s Forzley agreed. And Ripple has helped Siam Commerical Bank accomplish that. According to Sutivong, the bank has been transacting with real money for some time, although in a controlled PoC watched by the country’s central bank. On Sunday, during the Swell conference’s pre-events, the Bill and Melinda Gates Foundation also announced it’s using technology developed by Ripple with its release of open-source software Majaloop, which looks to provide an interoperability layer between financial institutions that offer services to the poor and unbanked. But with that being the only news to come out of Swell so far, XRP investors were seemingly less than ecstatic, selling off the cryptocurrency to drop the price about four cents during the day’s events. The commentary highlights just how contentious Ripple has become over the years, having launched as a bank-focused cryptocurrency play at a time when most cryptocurrency enthusiasts were very much anti-establishment. But Ripple’s executives have only fanned that fire. During the panel, Griffin also said that while cryptocurrency has a role to play in back-office cash management, the uses won’t be consumer-facing. And he says that’s because the technology lacks know-your-customer (KYC) features required by financial institutions and governments. While that could be seen as a fine complaint, one that puts Ripple ahead when it comes to mature financial services, Griffin’s other accusations were a bit harder to parse. For instance, he said bitcoin could never succeed if it took four hours to move money from one account to another (which doesn’t seem to be the case on average), and contended ether transactions can sometimes take 15 minutes. But yet, Griffin could not be swayed even as an audience member asked what the panelists thought was causing the rally around bitcoin. Yet, it’s interesting that Ripple would bring up nostro-vostro accounts (local currency-denominated accounts banks hold throughout the world), as the talking point was also on display at a rival conference across town. There at Sibos, also in Toronto, Swift announced its blockchain PoC focused on freeing up funds in those accounts was a success. In context, many see Ripple’s decision to throw an event on the same days in the same city as Swift’s big annual Sibos conference as a way to rouse its competitor. During the panels and presentations at Sibos, presenters seemingly went out of their way not to mention Ripple, the blockchain startup that’s taken aim at Swift in recent years. The closest anyone came was when the CEO of Swift Gottfried Leibbrandt took a jab at Ripple while describing the financial incumbent’s Global Payments Initiative. 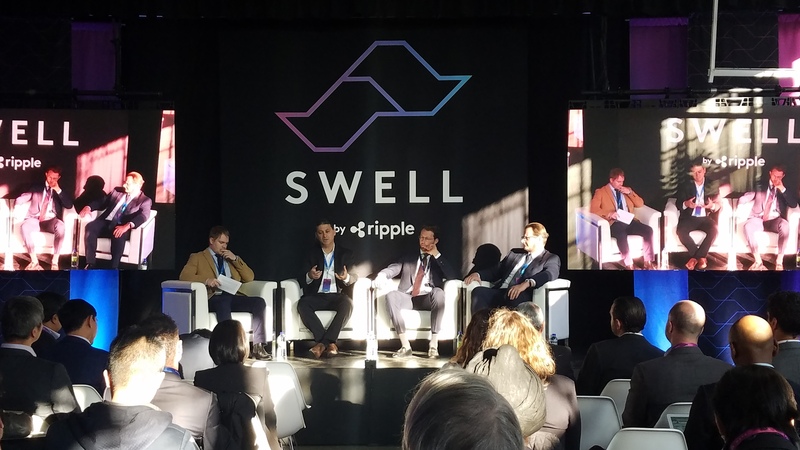 But at Swell, some of the panelists seemed unfazed by the head-butting, speaking broadly about blockchain’s advantages to the financial system. Disclosure: CoinDesk is a subsidiary of Digital Currency Group, which has ownership stake in Ripple and Veem.